Adaptable for the patio, picnic table, or tailgate, portable on its ownbuilt-in wheels, and foldable for compact storage, this grill provides a16-inch-diameter, round, nonstick cooking surface for any place, any time foroutdoor dining. A 1-pound propane canister (which is not included) heats thegrill evenly with no flames or flare-ups, while a groove in the middle channelsgrease to a removable drip tray for low-fat, healthful cooking. For slowcooking, a gray, matte-finish, domed lid with an adjustable vent covers thecooking surface. A dial-control adjusts heat to three temperatures. 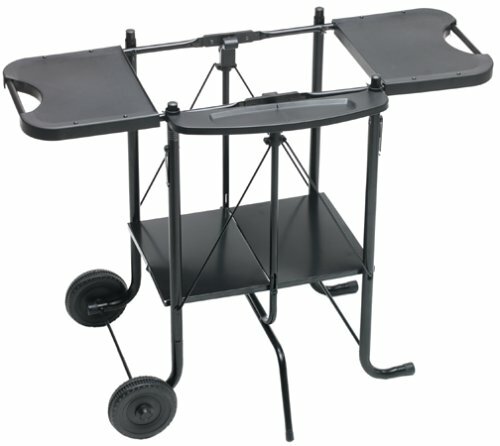 The grillcan be free-standing or, with its four legs tugged off, can be set on a table ortailgate. The legs are part of the grill's rugged steel frame and are stylishlypainted black. Very Nice and So Easy! When I saw the price on this grill, I thought the extra money for the propane tank, the gas hose and the propane was worth it. It really is. It evenly cooks anything I've put on it with a tight lid that has an exhaust to control how much moisture gets released. The clean-up is REALLY easy, as you just take the grill and the cover off and clean them by hand. That's all you need to clean. The tank is very easy to hook up and the heat adjustment works fine. My only complaint is even at the lowest heat range, I think it's still too hot. The best thing about the grill is that it packs up into a tight piece that you can store. When you get to your camp site, you can roll it around using a handle and the wheels, but the thing is so light, I just hand carry it. It's a great all around grill. The only thing I miss are the lighter fluid fumes. I never thought I would cook my own food. BUT, after watching a shopping network show with my sister I ordered this grill with my steaks. It was easy to set up, well made, and cooked an awsome steak. It was extremely reasonably priced. Im really impressed. Its a great value. 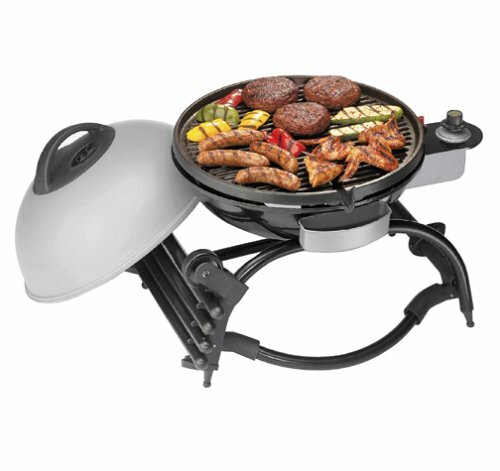 I have this grill in the elec mode and gas, there is a giant one, however, it is hard to find. Cooking is very good but the best is the clean-up, wipe it clean or wash it off since it fits in a normal sink. The nicest feature of the portable gas one is it is clean, ever put a charcoal or gas grill in your car?? The Target price is nice, I got some on clearance for $24.97!! I have also paid $99 when they could not be found anywhere else! However, each store carries on the average of TWO so you better buy it when you see it! I am e-mailing everyone on my family list that they are on Amazon.com for $59 with free shipping. We love them. I have owned the grill for two month now. I have to tell you I wasn't looking for one, but when my dad (a huge grill fan) came to visit, of course he wanted a cookout, now he is an expert. I went to the internet and do some research, I needed something really good and cheap, because I don't grill. So I found this George Foreman and thanks I read all the reviews before bying online; I drove to the store and really it was on sale, I saved few money and my dad was so happy with the real grilling taste of the meal that he wanted one for him. Before I got my George Foreman Portable Propane Gas Grill, I read about it and figured with all the raves, reviews, and feast of features, it must be too good to be true. I was in for a surprise. Being used to gigantic charcoal (and later gas) tubs, upon my GF Grill's arrival my first impression was, "That's it?!" Even though it's remarkably compact (especially when in "travel" mode) and light (just over 20-lbs), it's built of durable materials and is very sturdy. It takes about 30 mintues of initial out-of-the-box assembly and once you get the hang of it, less than 5 minutes from travel/storage mode to fire-up. The propane burner then takes about 7 minutes to fully heat the grill plate, so you can be grilling in under 15 minutes total. No more excuses about waiting for the grill to heat up! The lid is designed with 2 flew (exhaust) settings - juicy and juicier! The first summer with my GF Grill saw chicken, beef, and veggie kabobs, steak, beef and turkey burgers, and salmon, all with surprisingly tasty results. I'm not your weather-beaten grill guy, and try as I might, my GF Grill wouldn't let me ruin anything! ha! The manual comes with sugguested cooking times for various foods and they worked like a charm. The heat plate design is superior to the traditional grill grate for a couple reasons: 1) While it's famous for channelling away fat for lean grilling, it doesn't allow all your meat's natural moisture and juices to be lost to the charcoal/heating element, thereby promoting juicier burgers, steaks, etc...; and 2) It makes cleanup a snap. Gone are the days of that nasty, messy grill bristle brush. The GF Grill plate can be cleaned up with a regular wash rag in your kitchen sink in about 5 minutes (depending on the extent of your use). While many products claim to be portable, the GF Grill lives up to the title. In travel mode, this grill turns out to be about the size and weight of moderate carry-on luggage, easily fitting into the trunk of any car. Its wise use of 1-lb propane tanks (easily and cheaply purchased at most department/home improvement stores) frees the owner up from lugging around gigantic propane kegs or huge, messy bags of charcoal.